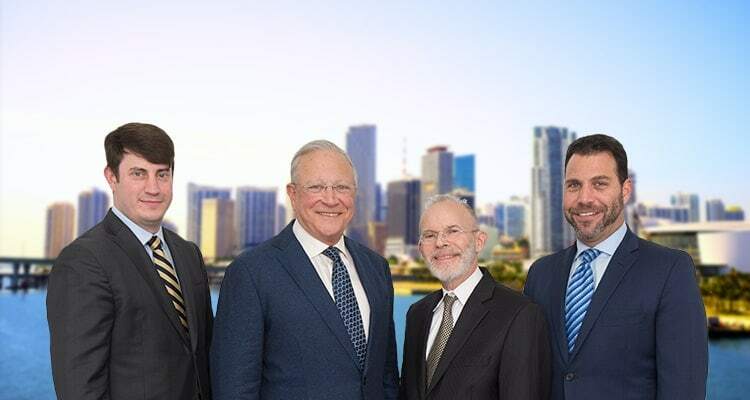 Nicholas I. Gerson | Miami Accident Attorneys Gerson & Schwartz, P.A. Contact Hialeah, Florida Personal Injury Lawyer Gerson & Schwartz, P.A. Nicholas I. Gerson is a personal injury attorney whose practice consists of representing plaintiffs in serious, catastrophic injury and wrongful death cases. 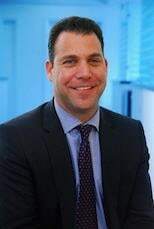 Mr. Gerson focuses on auto, truck, and motor vehicle accidents, cruise ship accidents, maritime and marine related injuries, negligent security, premises liability, victims of crime, and other complex litigation. Mr. Gerson is known within the legal community for his hard work, dedication and providing zealous legal representation. He has secured over 25 million dollars in jury verdicts and personal injury settlements in his first 11 years of practice. Some of Mr. Gerson's highlights include a $1.7 million dollar jury verdict against a Miami night club operator in a wrongful death case. 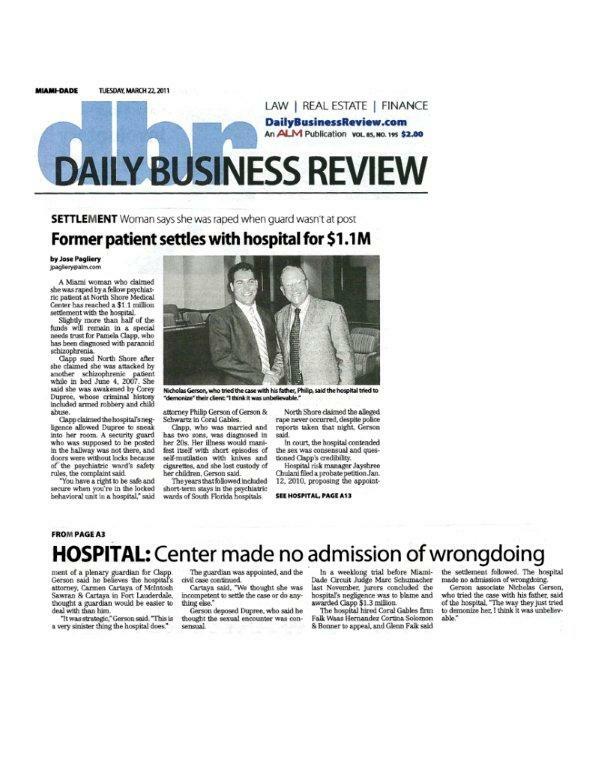 In 2017, Mr. Gerson was featured in the Miami Daily Business Review for a 10 million dollar jury verdict resulting from a shooting in a publicized crime victim case. Mr. Gerson received his Juris Doctor from St. Thomas University School of Law and served as a judicial clerk for the Honorable Henry H. Harnage in the Eleventh Judicial Circuit. He is a sustaining member of the Miami-Dade Trial Lawyers Association, the Federal Bar Association, Florida Justice Association, American Justice Association and the National Crime Victim Bar Association. Mr. Gerson has also served as a guest lecturer for the Maritime Law Society at St. Thomas University School of Law. Mr. Gerson is licensed to practice law in all Florida state courts, United States District Courts for the Southern and Middle Districts of Florida. 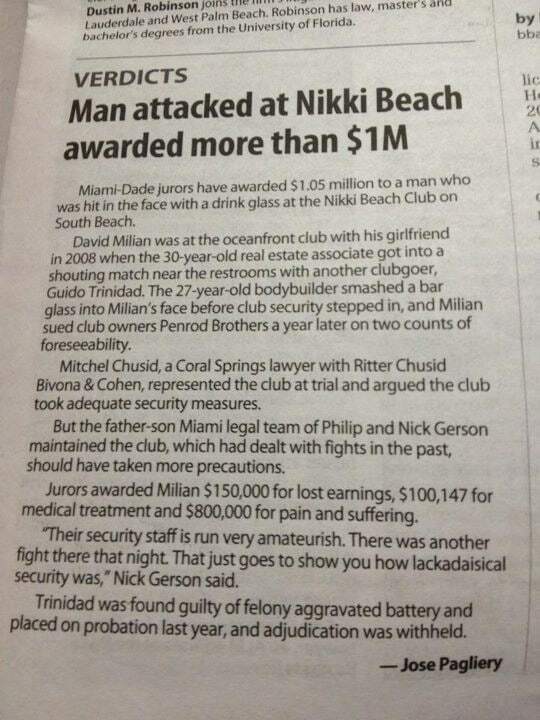 Mr. Gerson can be reached at (305) 371-6000 or via email at ngerson@gslawusa.com.